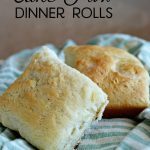 These Cake Mix Dinner Rolls are incredibly delicious - plus there’s no scary yeast in them! Pour water into a large bowl. Cover bowl and place in a warm spot to rise for about 1 hour. (I turn my oven on for a bit, then turn it off and let them rise in there). Grease a jelly roll pan and spread dough into it. Cut dough into squares (I use a pizza wheel). Cover and let dough rise again until it’s doubled.